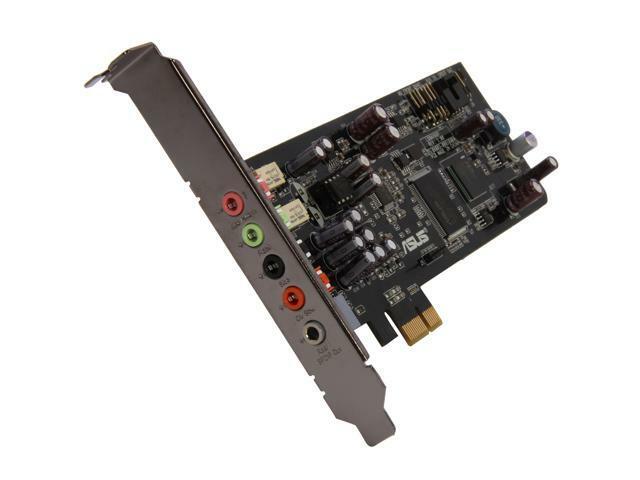 The Xonar DSX audio card combines DTS Connect technology with the ASUS-exclusive GX 2.5 gaming audio engine and onboard amplifiers. These result in accurate and deep audio that brings every nuance and sound across fully, making the new Xonar DSX 7.1 an ideal audio card for audiophiles. GX 2.5 for realistic 3D gaming audio effects Feel opponents sneaking behind you and hear voices echo in dungeons with the ASUS-exclusive GX 2.5 gaming audio engine, which allows up to 128 different sound effects at once for a realistic 3D audio experience. It also supports the latest version of EAX and restores surround gaming in Windows 7 with no additional software. DTS Connect technology for an immersive 7.1-channel surround experience Consisting of DTS Neo: PC and DTS Interactive technologies, DTS Connect brings the world’s most wanted hi-fi surround sound to your PC and turns it into a powerful multimedia center and game console. DTS Neo: PC converts any stereo signal into 7.1 channels while DTS Interactive turns all sound into sensational 7.1 DTS Digital surround via S/PDIF output – feed your AV receiver the best surround available! True 192 KHz/24-bit PC hi-fi enjoyment Enjoy music file conversion at the highest quality with no sample rate downgrade. Swappable operational amplifiers - tune up your own sound A design once only seen on hi-end audio equipment is now presented on the Xonar DSX 7.1. It allows you to customize your sound with no soldering, and thus create your favorite listening experience with ease. Automatic jack-sensing front-panel output The Intel HDA-compatible front-panel header automatically switches output between the back and the front of the case once speakers/headphones are plugged in. Never again will you be bothered by the need to change connection settings manually! Cons: -It can flat out fail to produce audible sound. Other Thoughts: So it has worked great for the first month or so. It then failed after a windows update. The sound produced is this static that renders anything inaudible. It's a nightmare sound. So after that I have tried everything to fix it but it just seems to be something that almost like quit. Here's the thing. The audio is still perfect when your get sound from the internals of the card(ie. recording the sound with audacity). However somewhere in the connection between the internals and the audio jack(both front and back) it becomes this awful noise! You're taking a dice roll when buying this card. It may work great or cause what I've had. Pros: Plug in, install W10 drivers, reboot, profit. Way better than my old realtek alc892. Equalizer for tweaking. Can do virtual surround on analog if you do it manually, and it works. Cons: All cool settings are locked to digital. DTS and Dolby is only on digital or headphones with this product. Other Thoughts: I would recommend to those with only onboard older motherboards. But not for people with newer chipsets and realtek 1220. My friend says that sounds awesome compared to the 892 he had. I am not an audiophile. But I do have a sensitive ear and I am a musician. This card is far better than my old on board. Cons: - Card's backplate doesn't conform to my case, while all my other cards have with no problems whatsoever. Trying to keep the plate flush with the frame leads to the card being unseated from the PCI x1 slot, so it's impossible to install a retaining screw like I would with the others. Other Thoughts: Functionally speaking, this is a great card, as long as you know exactly what you're doing to work around the compatibility problems and useless factory drivers. If you get it working, it sounds great, and the price is excellent. But if you're looking for something that's plug in, install drivers, and go, this is definitely NOT what you're looking for. Reading the other reviews I was convinced I would get lucky with the drivers and have this card plugged in and go. Sadly, this was not the case. To be clear, I'm no novice when it comes to figuring out weird workarounds for driver software, but I must stress that if you do have to resort to other methods to get this card working, you need to know exactly what you're doing. Pros: The card itself is awesome, great sound at normal/high levels. Bass boost is awesome! Lots of things to mess with to get the exact sound you're looking for. Cons: What should have been a 15 min install took hours. According to the user manual - They say that this card requires a 4 pin power connector. So with that in mind I pull the back side of my case off, dig out a cable, move my graphix card to the bottom x16 slot, end up accidentally unplugging my hdd, pulling a pin out of 1 of the molexes, sliced my finger on the case unplugging stuff/plugging back in, unplug my main monitor's adapter.. (all separate issues i had to troubleshoot individually, l,m,a,o) only to get the card plugged in and find out it DOES NOT require a 4 pin power. It's hard to get it to sound decent at low volume levels when you're trying to be quiet at midnight-1am+ but after messing with everything forever, I got it sounding good. Just choose the Bass preset and turn up your mids/highs a couple notches. Other Thoughts: I thought about giving this 2 or 3 eggs just because of all the b,s I had to go thru. If Asus would actually update their user manual instead of re-printing old ones, I would have been done a long time ago. That aside, this is an awesome card. I look forward to being able to turn it up tomorrow and see what it sounds like at a good sound level with the bass boost enabled. Pros: Sound quality is great. Been using it everyday since April of this year and have had zero problems as of yet. Using it for a 5.1 speaker set up. Pros: 3.5mm outputs and swappable amplifiers. Cons: Asus in my experience, is pretty good a keeping there driver up to date, but not for this one. The drivers they do have, have an awful GUI, that is practically useless. NO manual gain adjusters. It closest thing was smart volume but, when there was minimal sound to would max out the gain. You can't substantially adjust the volume of each output independently. NO detracted sound processor, resulting my CPU working harder than it needed to. SOUND LOOPS followed by game crashes, STATIC INTERFERENCE(from lack of grounding) and awful speaker location adjustment. How am I supposed to keep trace of a tiny black optical adaptor anyway !? Other Thoughts: I just expected more from a $70+ ASUS sound card.